Waiting on Wednesday is a weekly meme hosted by Jill at Breaking The Spine. It showcases each blogger's most anticipated books. 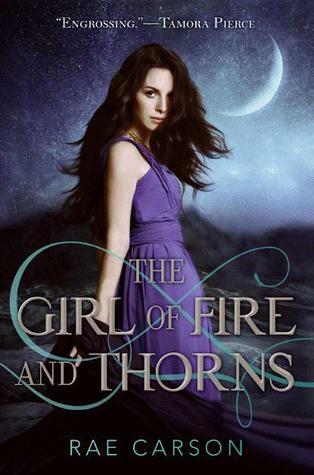 This week, my pick is The Girl of Fire and Thorns by Rae Carson. Summary:"Once a century, one person is chosen for greatness. Why I Can't Wait:First off, love the cover. I love the colors, and sensing sort of mysterious, with a strong leading lady vibe. Nice! Secondly, I love the summary. I'm curious about where the story will go, and what the meaning behind being the chosen one is all about. Lastly, whenever we were at TXLA, the publishers ran out of ARCs of The Girl of Fire and Thorns, but told me about how amazing it is, and how I *should* be looking forward to reading it. If that isn't enough, I don't know what is! Nothing like not being able to get the book to make you want it more! Wow!! I am in love with this cover!! This books looks so interesting!! I just added it to my TBR list!!! That cover is to die for! LOVE!! I'm excited for this one, too. It sounds like an awesome book. Great pick!